TechArcis is a specialized QA and testing solutions company. We provide comprehensive solutions and services portfolio for complete alignment with your business objectives. 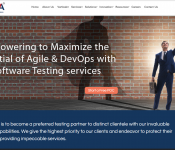 Our objective is to address all of your QA and testing needs, deliver testing transformation, and assure continuous improvements. QACompanies is the ultimate directory and guidance of the software testing companies. We provide the most complete software testing companies list and reviews of quality assurance companies. © QACompanies 2019. All rights reserved.